THINGS got pretty hot for everyone during the Salt Ash bushfire today - including a baby possum who made a dash from the burning bush for safety. 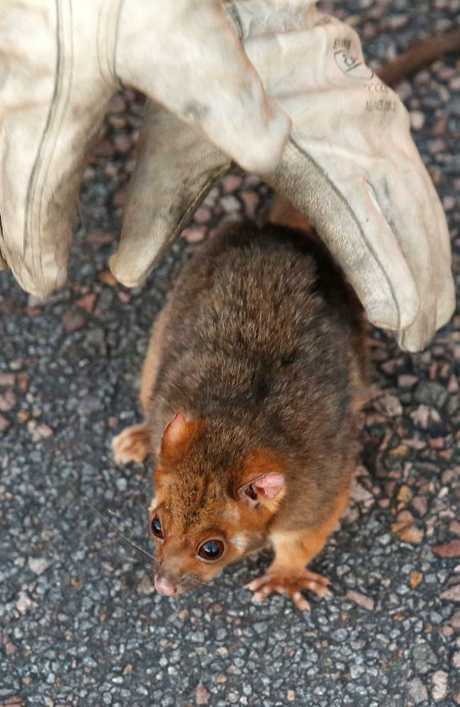 The tiny marsupial was seen desperately trying to escape the flames before quick-thinking firefighters sprang into action and lifted it to safety near a road. 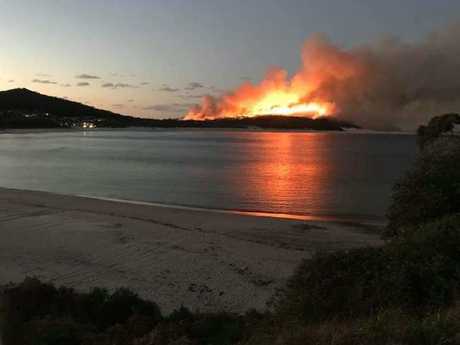 The Port Stephens fire, which has ripped through almost 2000 hectares of bushland, is now being controlled by multiple crews, who will remain on scene and work through the night to protect 70 homes. During the day though, walls of flame reached "in excess of 20m", dwarfing firefighters and tankers and threatening livestock and properties. Strong winds are still lashing the area and the danger is not over yet, the RFS has warned. 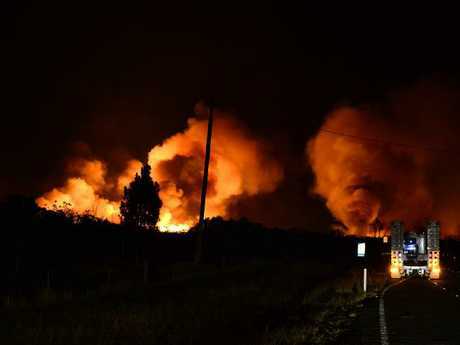 A bushfire southwest of Ballina - which was also declared an emergency late today - has also been downgraded as conditions begin to ease after nightfall. The blaze at Ellangowan - which has burnt 2000ha - broke containment lines and jumped a creek about 4.30pm, prompting authorities to issue an emergency warning. Residents in isolated homes and rural properties were told it was too late to leave and to seek shelter, but at 6.30pm firefighters said the threat had eased. 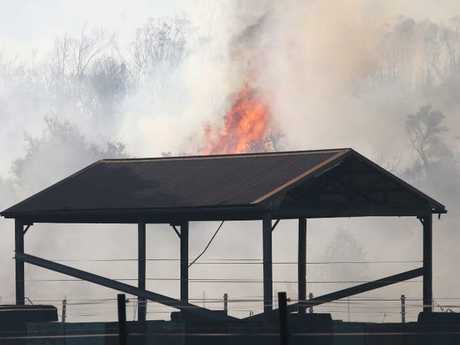 "Residents should continue to monitor the situation should conditions change," authorities said. Minister for Emergency Services Troy Grant took to Twitter tonight to voice his support for crews battling blazes across the state. 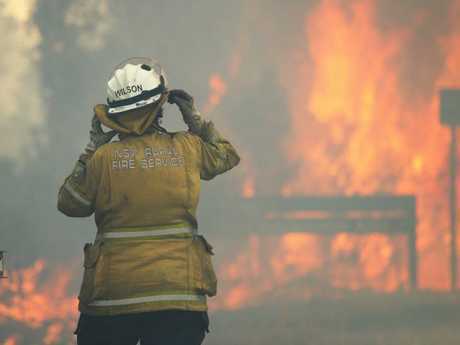 "I can't express adequately how proud (and) appreciative I am of all (emergency) efforts in hellish fire conditions across NSW this week and weekend," he wrote. "Amazing effort battling changing and high winds helped by supportive community adhering to warnings. "More difficult weather ahead this week before hopefully some respite will ensure many battles are far from over and there will be plenty of mopping up and recovery to be conducted. "Again thanks especially our volunteers as usual stepping up in true Aussie spirit." 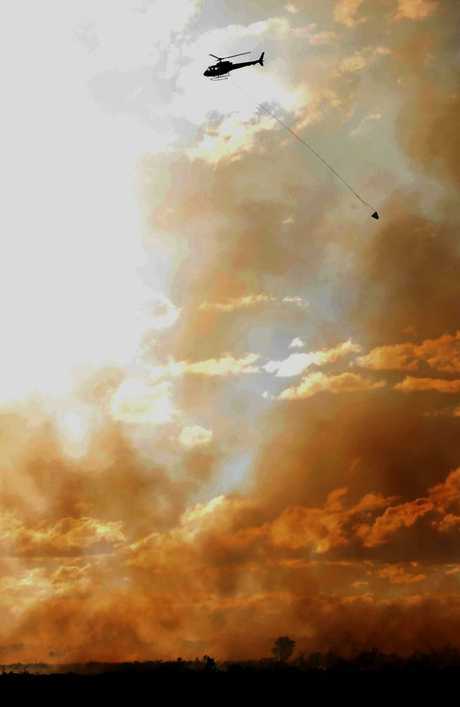 More than 80 fires remaining burning across the state and 1200 firefighters are on standby. A very high fire danger remains in place for NSW's northeast as well as the greater Sydney region. "Whilst it is a little bit cooler, those strong winds are going to keep fanning those fires," Mr Rogers told Seven News tonight. "We're looking at those winds extending into around Wednesday." Nearly 20 buildings, mostly outbuildings, have been destroyed by fires since late last week. On Friday, helicopter pilot Allan Tull died while waterbombing a fire west of Ulladulla, on the NSW South Coast. It's believed the 1994 Kawasaki helicopter's water bucket became stuck in trees, pulling the chopper down. 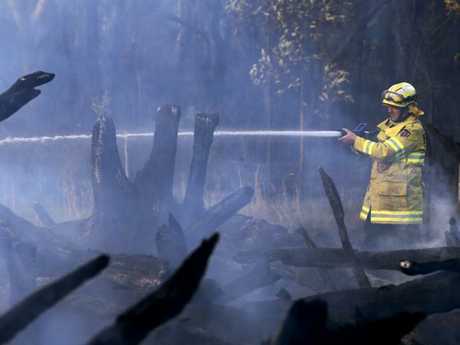 Firefighters gained the upper hand over a fierce fire in Salt Ash, near Port Stephens, about 5pm, after strong westerly winds began to die down at dusk. It is currently at watch and act level and is being controlled. It's believed a caravan may have been destroyed in the fire but crews are yet to confirm, RFS Deputy Commissioner Rob Rogers said. A NSW Rural Fire Service spokesman said crews are working to contain the fire. "The conditions are easing - the wind has reduced significantly," he said just before 5pm. "Crews will remain in place, there is still a lot of work to do. 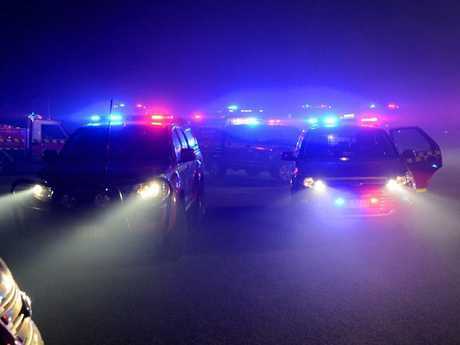 Conditions could change and we could see another escalation." 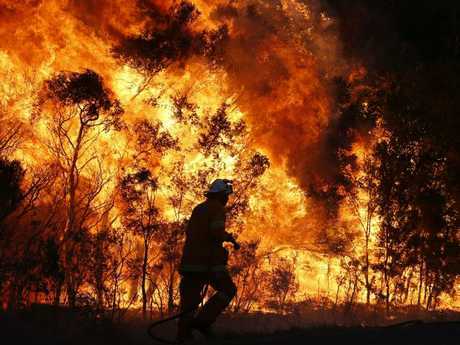 Earlier today firefighters surrounded homes and warned residents to seek shelter as the out-of-control bushfire edges close to properties near Newcastle as it was too late to leave. 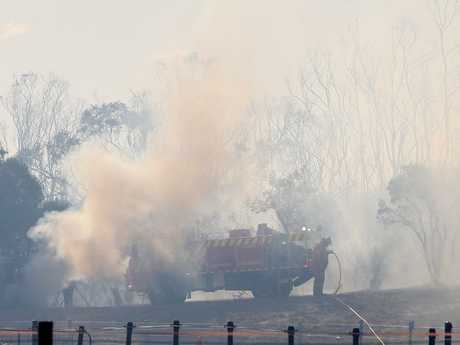 NSW Rural Fire Service ground crews and waterbombing aircraft in Salt Ash battled the fierce blaze, which had already torn through more than 1700 hectares of bushland. Strong westerly winds fanning the flames and whipping up embers as the front moved towards houses near Rookes, Lemon Tree Passage and Brownes roads. However about 4pm, authorities said conditions at Salt Ash had started to ease, although properties were still under threat. 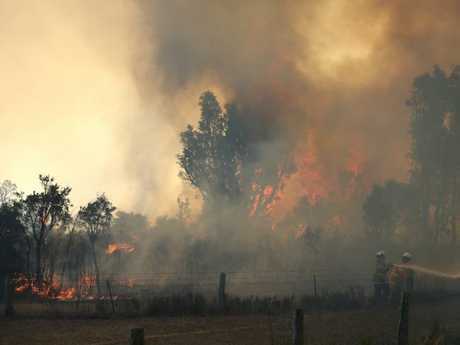 At the time, the fire was burning out of control near more than 70 houses, with firefighters taking up positions on the ground as waterbombing aircraft attacked the blaze. 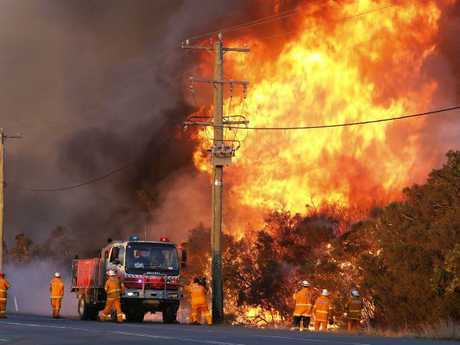 "Winds are slowly starting to abate, but there is still a threat to properties," a NSW RFS spokesman said just after 4pm. Earlier authorities had warned: "Embers may be blown well ahead of the fire, creating spot fires and threatening property before the main fire front arrives. Follow the advice of firefighters on the ground." "Crews are undertaking property protection and while the fire is erratic they will remain in place," he said. "It is still out of control." About 5pm, the emergency warning was lifted. 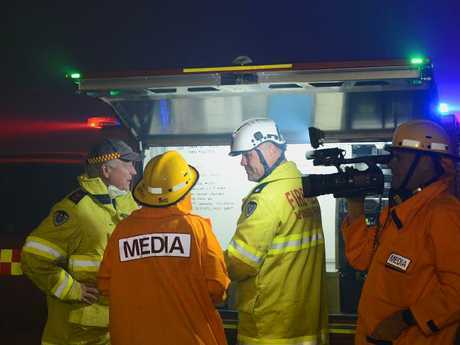 The emergency response near Salt Ash, Port Stephens last night. Last night the Salt Ash community banded together in surrounding suburbs as people were evacuated from their homes. Club Lemon Tree manager Jayson Towler said people took refuge in his restaurant in Lemon Tree Passage last night. "We're a small town - it's what we do," he said. "If people have to sleep here that's fine. We've had locals come and bring in some pillows and blankets." In Tanilba Bay, Tilligerry RSL manager Robyn Corbett said people slept on the floor of the clubhouse last night. "We're alright here - it's very smoky, very windy - last night was a bit hairy," Ms Corbett said this afternoon. The area had an influx of travellers who were in town for a darts tournament. Meanwhile, another fire is burning in an easterly direction towards a pine plantation near Glen Innes in the north of the state. Motorists are advised to avoid the area. These fires form part of 84 fires currently burning in NSW this afternoon, 32 of which are uncontained. More than 1000 firefighters, 330 vehicles and 42 aircraft are battling the fires. And the danger could worsen this afternoon, with Bureau of Meteorology duty forecaster Jordan Notara saying winds upwards of 40km/h are expected to last into the evening. Mr Notara said the strong winds were due to a low pressure system moving through the Tasman Sea following yesterday's cold front. "Conditions are generally windy," he said. "Into the evening you would normally expect these winds to die down." A fire truck was damaged during the blaze at Tabulam, near Casino, yesterday afternoon. Police arrested a 14-year-old boy, who was charged with intentionally causing fire and being reckless to its spread and leaving a fire lit in open air without extinguishing it. He was granted bail and will front a children's court next month. 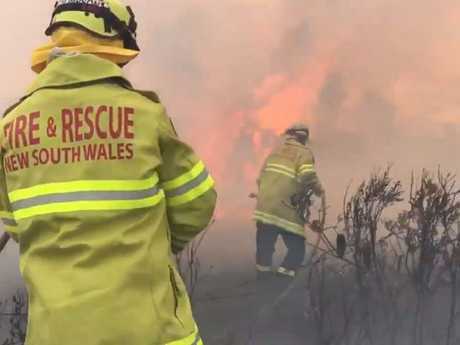 Last night firefighters were fighting an out-of-control blaze on the state's South Coast, after a long day fighting wild winds threatening houses. The bushfires were raging at Salt Ash, near Port Stephens, Mount Kingiman, west of Ulladulla, and Tabulum between Tenterfield and Casino today. A strong wind change over the Hunter fireground late in the afternoon pushed the fire north towards Tanilba Bay, Mallabula, and Lemon Tree Passage, closing Oyster Cove Rd and Lemon Tree Passage Rd. No houses were damaged in the Hunter, although an emergency warning is in place as firefighters defend properties. The Rural Fire Service has warned people south of Oyster Cove Rd, on Rookes Rd or Lemon Tree Passage Rd, to put their bushfire plans into action immediately. 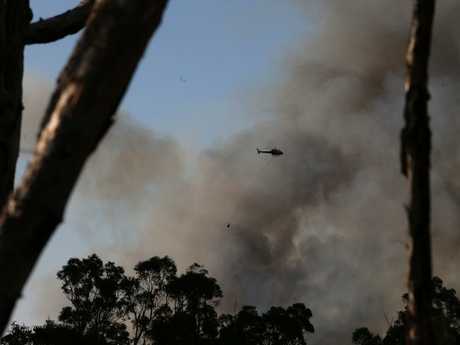 At Tabulam, 800km northeast of Sydney, 60 firefighters from across the district, aided by a helicopter and three planes, fought a fast-moving grass fire. 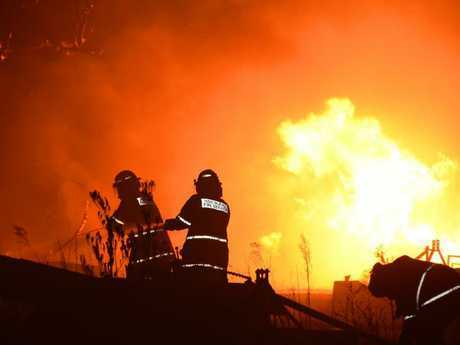 Three sheds were completely destroyed and the wooden bridge that carries the Bruxner Hwy over the Clarence River briefly caught alight but was extinguished before any structural damage was done. 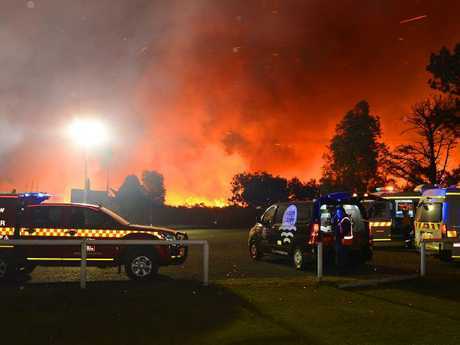 "It could have been significantly worse given the conditions and the speed the fire travelled, which was really quite amazing," Northern Tablends NSW RFS manger Chris Wallbridge said. 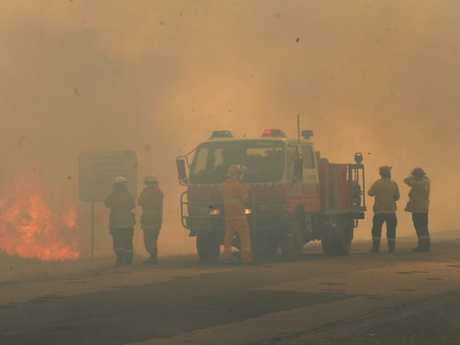 While firefighters battled the blaze, residents in the small town between Tenterfield and Casino took shelter indoors, as there wasn't enough warning to flee. The Tabulam fire was brought under control, although power to the town was cut by fallen power poles. 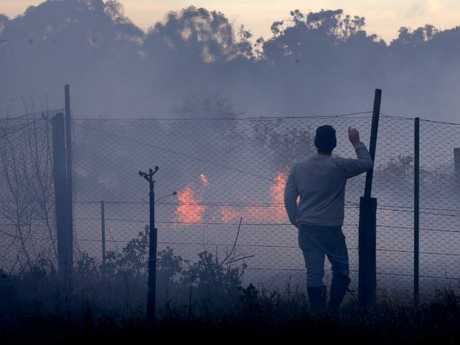 The blaze on the South Coast was downgraded from an emergency to "watch and act" in the afternoon after winds eased sufficiently for firefighters to track down and douse spotfires that cropped up ahead of the main fire-front. 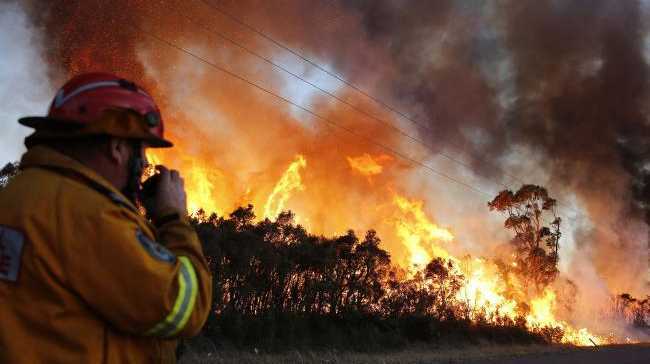 The winds which kept firefighters busy looked set to continue, according to Bureau of Meteorology (BOM) duty forecaster Jordan Notara. There's a gale force wind warning in place for coastal waters off Sydney, where winds would increase today and early on Monday, up to 60km/h. The winds will whip up wild surf, with southerly swells up to 4m forecast to build in keeping with the wind speeds. As for Sydney's weather, it will be a cool week with drizzle on the horizon. "In the early part of this week Sydney will be cooler than average, with temperatures in the teens," Mr Notara said. "From Thursday and into Friday there's potential for some showers, although they're only expected to be light." News PALMERIN St will be off limits to traffic until after lunch. It is one of many Southern Downs roads closed for Anzac Day services today. News Hundreds turn out to her student's tribute at Warwick Dawn Service. News Find out where and when you can catch a RAAF flyover. News Student reflects on a wonderful life cut short.